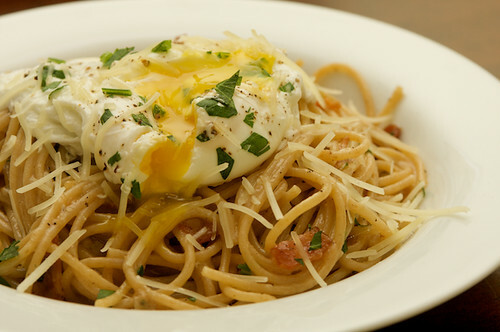 Peppery Pasta Carbonara with Poached Egg « think liz. When I was in Italy, one of my favorite dishes to get was Pasta Carbonara. If you’ve never had it before, you are missing out. It’s a delicious Italian version of bacon and eggs – the sauce is a rich mixture of cream, eggs, cheese, pancetta and parsley. It’s indulgent, to say the least. Yum. I did double the recipe without a problem (and I used whole wheat spaghetti) but I think this is a great dish for one. So, I am sharing with you another recipe that I will be repeating this week. It is indulgent but oh so delicious. This entry was written by Elizabeth, posted on October 6, 2009 at 7:42 am, filed under Pasta, Recipes and tagged carbonara, egg, Pasta, poached, recipe, Recipes. Bookmark the permalink. Follow any comments here with the RSS feed for this post. Post a comment or leave a trackback: Trackback URL. 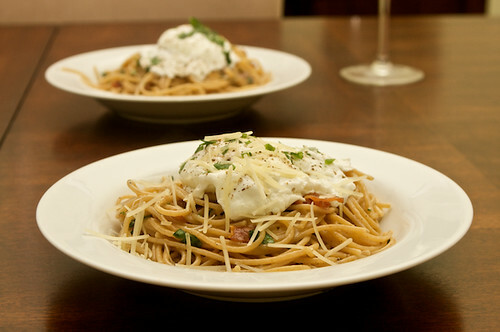 Never would of thought to couple a poached egg with pasta…Looks delicious! I never tried pasta carbonara and I must say, I’m not so sure about having bacon and eggs with my pasta…but if you say it’s good then maybe someday I’ll have to try it! Oh it’s better than good! It’s amazing! One of the best parts is that the ingredients are so simple – I pretty much always have them on hand. I love Carbonara too, but a traditional carbonara doesn’t contain any cream at all – it’s still not exactly low fat though! The creamy texture comes from just adding the egg right at the end so it doesn’t over cook, the egg cooks in the heat of the pasta. I love the idea of this variation though with the poached egg. I also like a small handful of peas mixed through my carbonara – maybe that’s a British thing or just something we did by accident once and it worked out quite well!